A stainless steel ring with a different look-mesh. 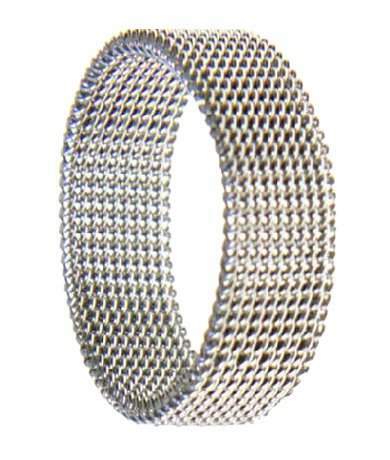 At 8.3 mm wide, this ring is created in mesh - so it is flexible and comfortable. 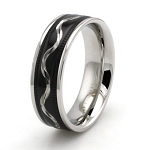 The design of the mesh and the matte finish combine to make a unique looking ring. Love the flexibility in this ring! I would recommend it to anyone that does heavy work with their hands, it doesn't crush or pinch. The quality and style is geat for the price but the fit is very snug. If would recommend you chose the next size up. I purchased this for the flexibility, and boy how nice it is! 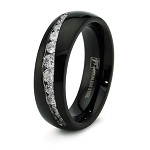 I drive alot and I started having problems with usual wedding band putting pressure on finger. This band fixed that problem and is the most comfortable one I have. Ring is pretty unique and its very comfortable especially for first time ring wearing. Great quality and detail was put into the making of this ring. I was very impressed.